Ignoring the historical significance, it’s not hard to see the appeal of Halloween for kids. Dressing up in a crazy costume, calling on your neighbours so that they can give you sweet treats, and eating so many sweets that you’re bouncing off the walls – what’s not to love! 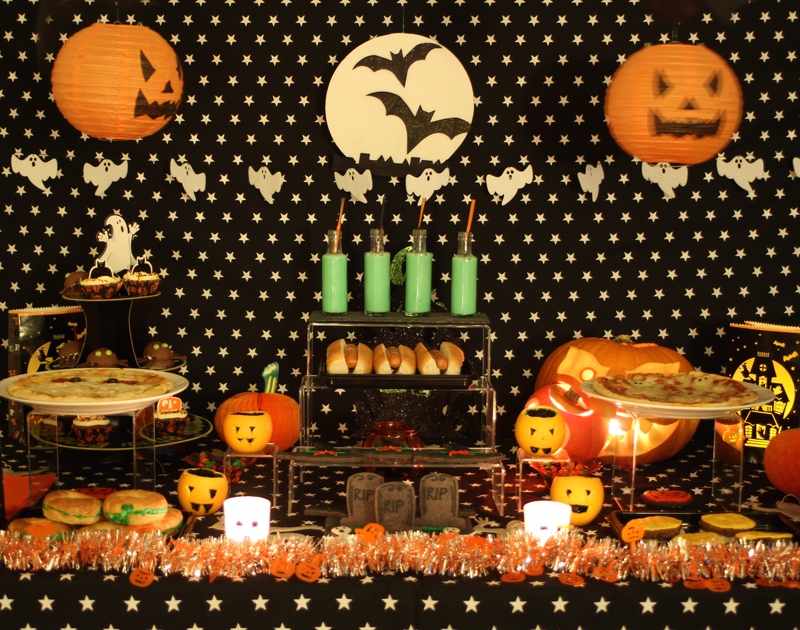 Last year Lulu declared Halloween as the ‘Best Day Ever’ – for me that title will always be held by Christmas, but Halloween does provide the best opportunity to practice some kitchen alchemy and explore the darker side of your creativity to create some gruesome party food. Here are some of the Mook and Lulu Halloween offerings for this year. In the moments when I trip, again, over the trainers casually strewn about the floor, or plunge my hand down the back of the sofa to discover the uncomfortable lump under the cushion is a man’s sock, or when I seem to be continuously transporting bottle tops from the kitchen worktop to the bin, the thought of Daddy Mook & Lulu being a pretty fab dad is not foremost on mind. But, he is a great dad, and Mook and Lulu adore him. When I’m rushing about trying to contend with the fallouts and triumphs of our busy lives, it can be easy to over look that Daddy ML gets up at 6am everyday with our early risers. The hours spent huddled over the table creating Lego masterpieces, with Mook and Lulu, easily slip my mind, and the mountainous challenges for a man outnumbered by females at home weave seamlessly, and unnoticed, into our everyday lives. So it is only right and proper that we take the time, on Father’s Day, to think about all the things great Dads do and to say thanks – perhaps as a nod to the fact that we really do appreciate them. In a time where we strive for the new ‘this’, or the best ‘that’, sometimes a simple gesture with a bit of extra thought can be a heartfelt gift. So, here is the Father’s Day Breakfast in Bed – with love from Mook & Lulu. 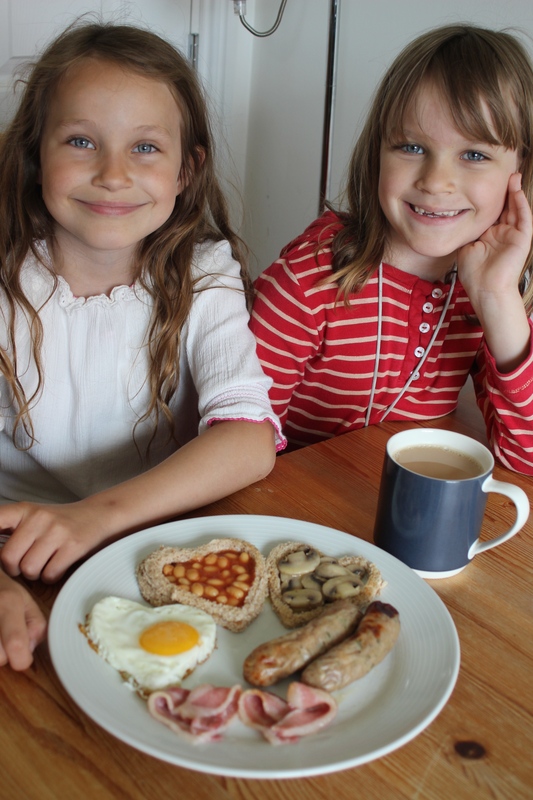 Hearts, a cooked breakfast, and a treat the kids can get involved with – perfect! 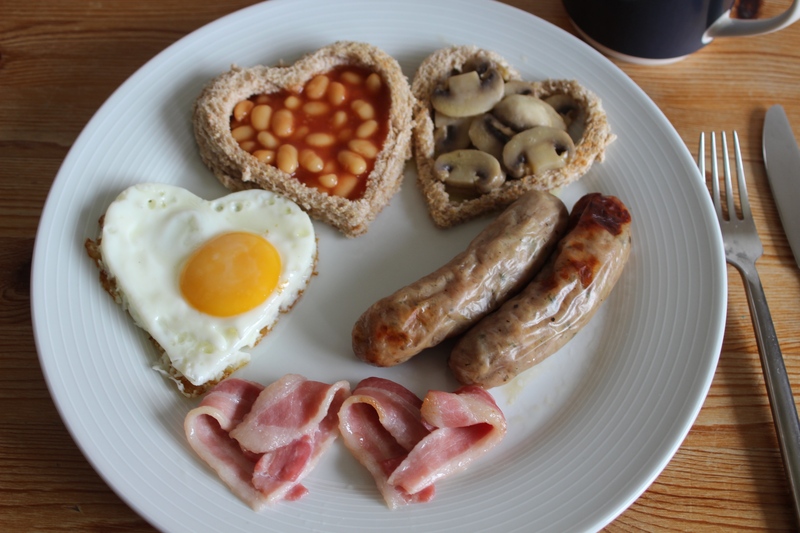 Hearts and a cooked breakfast! Birthday Parties can be an expensive business. 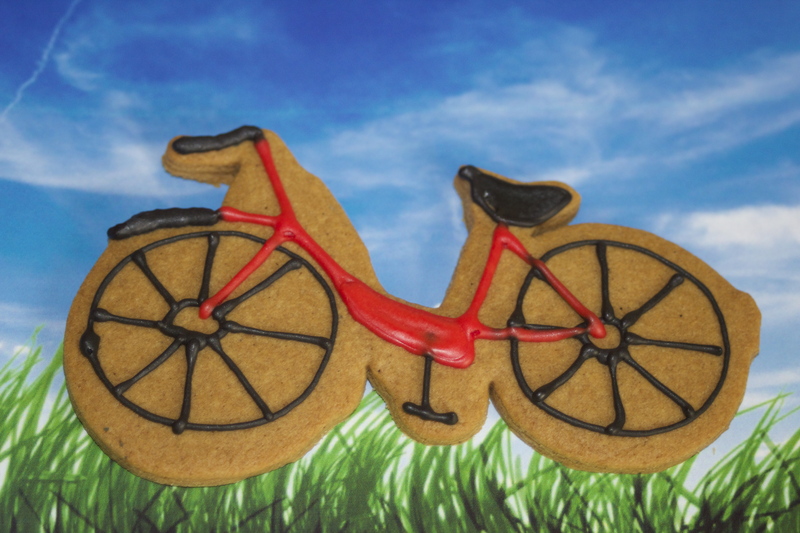 So this year, when Mook wanted (needed) a new bike, we talked about ways that we could scale back on a birthday party as she was having such an expensive present. She was very gracious, possibly helped by the fact that we bought the new bike two weeks early, and we all sat down and talked about possible party ideas. Lulu hit on the great idea of having a ‘Bicycle and Scooter Party’ – which went down well with everyone, and so, this year Mook’s Party was a fantastic reminder that simple pleasures can be an absolute delight – and don’t need to cost the earth (literally!). 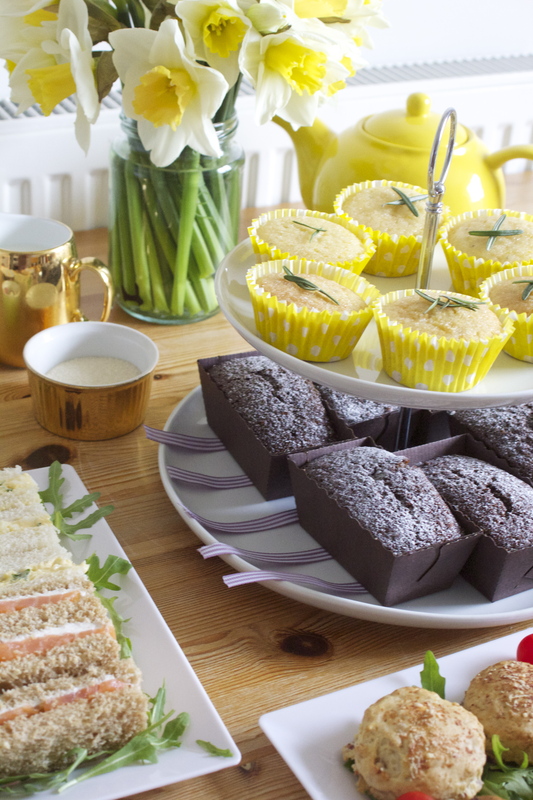 ‘Ooh, I didn’t expect you to go to all this trouble!” said Nanny M&L, when she arrived for her Easter afternoon tea, but there is something special about showing how much someone is appreciated with homemade gifts. Lulu helped make the cakes, and as she proudly presented her sticky gingerbread to Nanny (for once heeding the plea not to bound in), it was lovely to see that she also understood the joy of taking the time to make something yourself. I love that my kids are now old enough to help in the kitchen. There have been several occasions where I’ve lost Mook and Lulu’s help in the kitchen once the cake mixture has been made, as they disappear off, spoons in hand, to ‘clean’ the mixing bowl. Lulu and I enjoyed making our Easter cakes together, but I would advise using a sprinkling of patience, and a serious adjustment to your schedule – little hands and lots of questions do make the process last a little longer than usual! 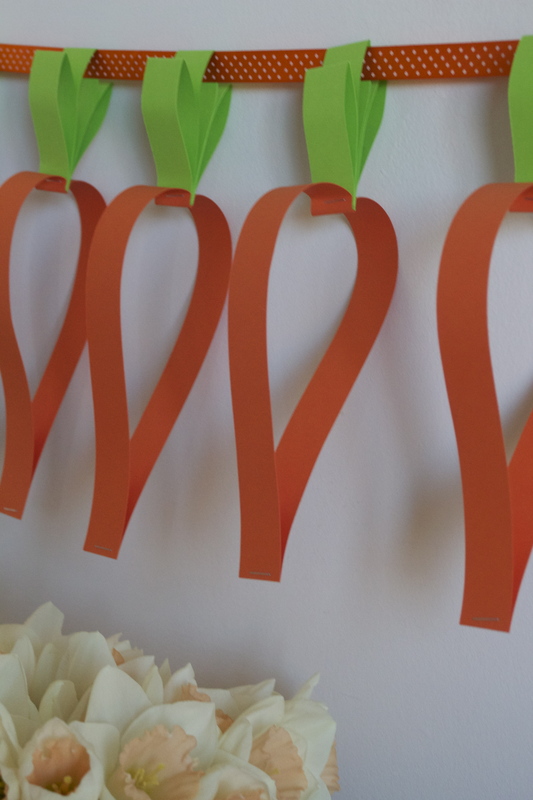 Easter is another great opportunity to try something new with the kids, and brighten things up with some Easter decorations – and this Carrot Garland certainly fits the bill. It’s very quick and easy to make, and should keep the kids busy for an hour or so. My dear friend Becky recently contacted me to ask me to join the Writing Process Blog Tour. Becky’s blog http://pagetoplate.blogspot.co.uk reveals her exploration and recreation of food in literature. Having been fortunate enough to sample some of Becky’s fabulous cooking, and being aware of her great knowledge of literature, I can think of no finer person to enlighten readers of the wonderful relationship between food and literature. Do pop across and have a look at her blog. As part of the Writing Process Blog Tour bloggers answer four questions about how they write, and then introduce fellow bloggers, who will continue the process. Here are my thoughts about my writing process.